What Gardening Region Am I In? In every issue of Fine Gardening, experts from across the United States (and sometimes southern Canada) offer plant recommendations suited to their regions’ specific growing conditions. Our “Regional Picks” are very popular with readers and elicit a lot of mail. Here are responses to some of the questions and comments we receive most frequently. Which regions do you cover? What region am I in? 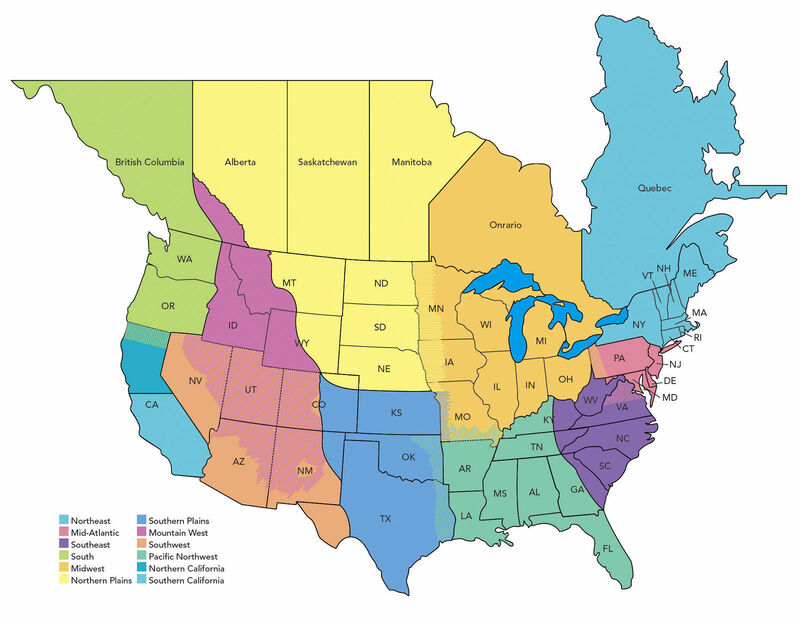 The 13 regions that Fine Gardening covers are sketched out on the map below. As you can see, some of these regions are very large, and some of them overlap. The boundaries between regions are likely even fuzzier than shown here, and they don’t necessarily follow state lines. We know that growing conditions and soils can vary quite a bit within a region, but our regional authors try to find plants that will work well for as many gardeners as possible in their area. Why wasn’t my region covered in this issue? Reader surveys consistently indicate that seven regional pages per issue is just the right number—six pages are not enough, and eight would be too many. Obviously, that means we can’t cover every region in every issue. We try to rotate through them so that each region is covered at least a couple of times per year. I read all of the regional pages, not just my own. Gardeners love to peek over each other’s fences to see what’s growing, and the regional pages have the same appeal. It’s fun to see what people on the other side of the country can “get away with,” and it’s always worthwhile to check out the recommendations for regions with a similar growing season to yours. For example, plants recommended for the Northeast may also be good choices for the Mid-Atlantic or Midwest. So go ahead—read the whole section, and get to know some great plants! Gardeners from coastal Alaska will find that the Northwest regional page may address some of their gardening concerns. Unfortunately we do not cover areas outside of North America. We apologize to gardeners from Hawaii, Puerto Rico, and other tropical climates. Still, information on pruning, caring for houseplants, maintenance, and other generalized gardening tasks unrelated to region will apply to all gardens, and we invite you to peruse at your leisure.